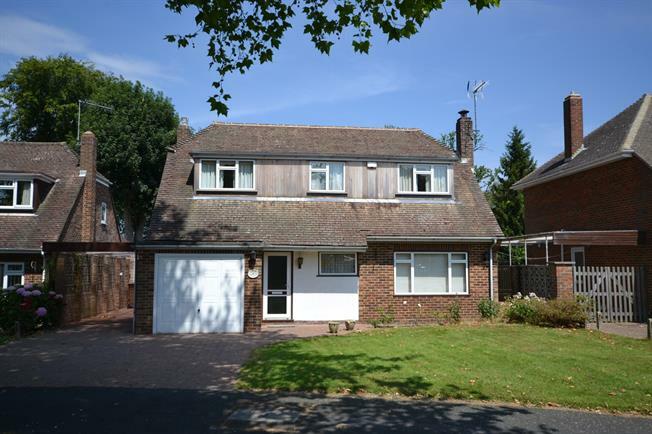 4 Bedroom Detached House For Sale in Tunbridge Wells for Guide Price £625,000. Guide price 625,000 - 675,000. Freeman Forman are delighted to present this chain free four bedroom detached family home, located in the popular village of Langton Green, within reach of the highly regarded Village Primary School, The Local Pub and Village Green. The property offers enormous potential to be extended and improved subject to any necessary planning consents. The rear garden is of a generous size and benefits from a large patio area considered to be ideal for entertaining. The accommodation includes an inviting reception hall with under stairs storage, large L shaped sitting/dining room with sliding patio doors to the rear garden, kitchen breakfast room, cloakroom and integral garage. Stairs rise from the reception hall to the first floor landing where four bedrooms can be found along with a bathroom. Outside to the front of the property is a large driveway for off road parking, and a side car port with gated access to the rear garden. The property occupies a pleasant position in a small close. There is a gas central heating system, house alarm and double glazing. An internal viewing comes highly recommended so that buyers can fully appreciate the exceptional plot size and potential.